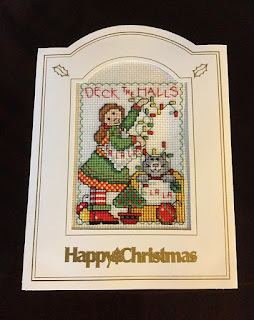 I haven't blogged in a while and when I saw the email from the lovely Jo about her Advent Blog Hop I htought that wasw just the thing to get me started again. However "Man proposes, God disposes" and if I thought I had been busy then December has been nothing short of manic. It has been almost a needle free zone with many other things taking priority. 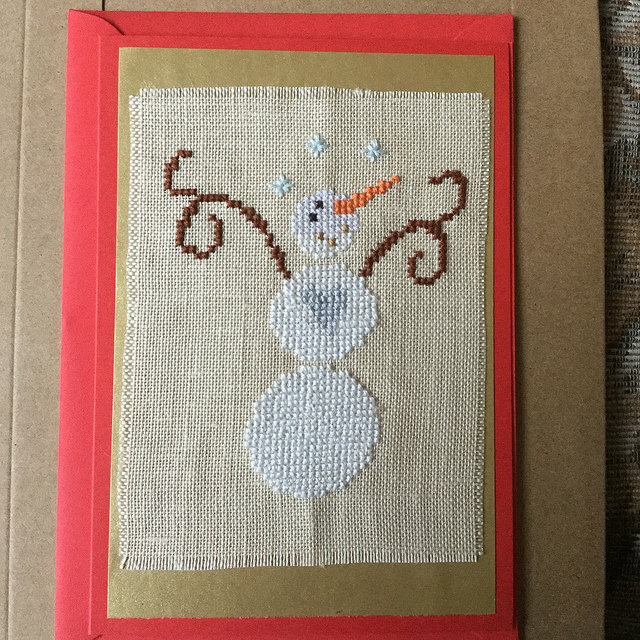 Luckily I did finish and mail a Christmas card for a small exchange I organised. I used my favourite DMC variegated thread 115 and DMC blanc on 32 count opalescent raw Belfast linen. It was a really enjoyable stitch. Jo has asked if we have any Christmas Eve traditions. As I have always been working on Christmas Eve I'm afraid my traditions are wrapping the last of the presents for the children/grandchildren, prepping the veg for Christmas lunch and attempting to get to bed at a reasonable time. Not very exciting but for our family the excitement starts on Christmas Day and includes Boxing Day as we celebrate both days (and have Christmas lunch both days). 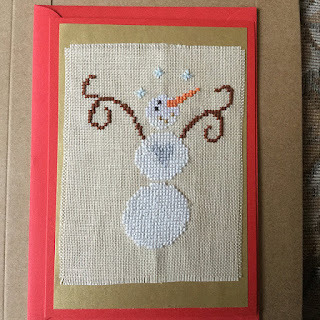 I hope everyone has a wonderful Christmas however you spend it and a happy, healthy and stitch-filled New Year. I have found it really difficult to find time for everything I want/need to do these past few weeks and as a result my blog posts have fizzled away. What little spare personal time I have had I have prioritised my stitching. The plus side of course is that I haven't had a lot of time for stash shopping either. In July I managed to fit in a visit to my favourite London shop, Liberty's, when I was there on business. There was a sale on and I bought a few presents as well as treating myself to some irresistible fabric and a bargain needlepoint kit. Liberty's don't sell a lot of cross stitch material but I did find a piece of French 32 count linen for only £3.99 - I couldn't leave it behind even though I don't know yet what I am going to use it for. 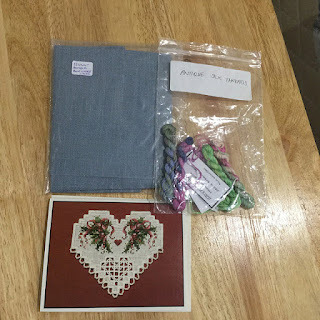 The other expenditure was on some hand dyed threads from Jodyri's Designs. Only one small finish this month - a birthday card using a Michael Powell design from a magazine. 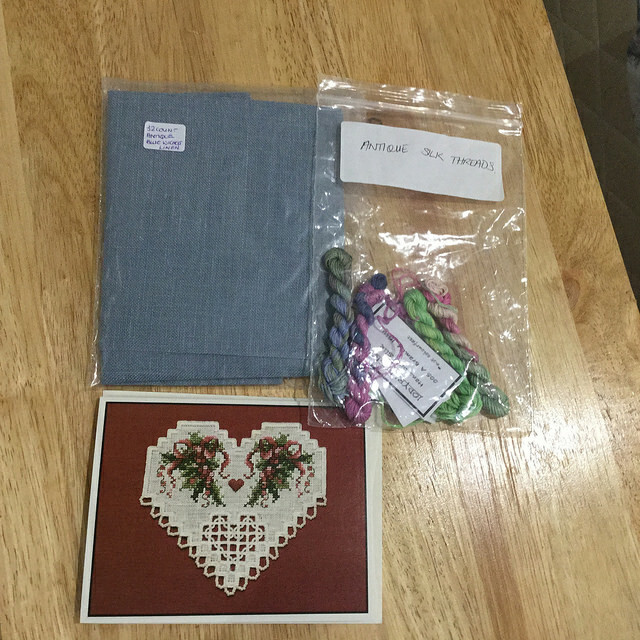 I bought 2 cross stitch items for myself this month. It's called Fibery Friends and as you can see I have found the perfect fabric in my stash. I will also use threads from stash as it will be easy to sub any I don't actually have. I also bought part 5 of the Shepherd's Fold kit series by Shepherd's Bush. I'm not counting this spend as I was already committed to it before SFS began (in fact the series should have finished at the end of 2014 but it has taken much longer than expected). There is only one more kit to complete the series - hopefully before the end of 2015! 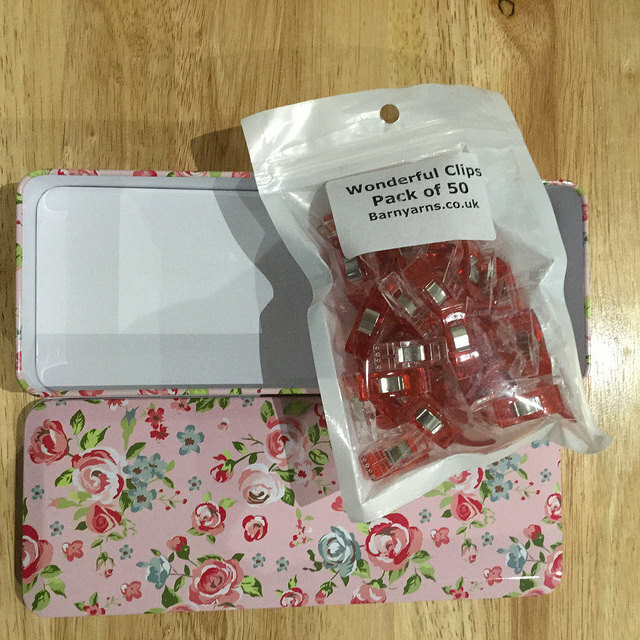 Wonderful Clips bought at the Malvern Quilt Show together with a pretty tin to store them. 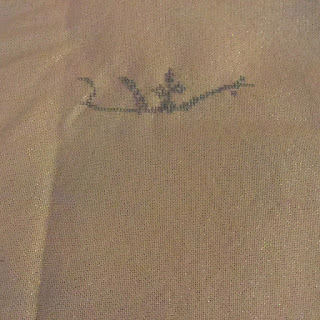 Permin linen and Jodyri Designs silk threads. 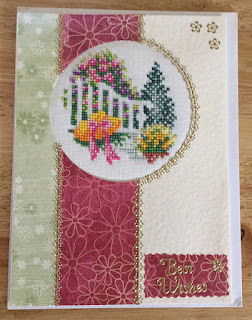 The card includes a pattern for the hardanger design. 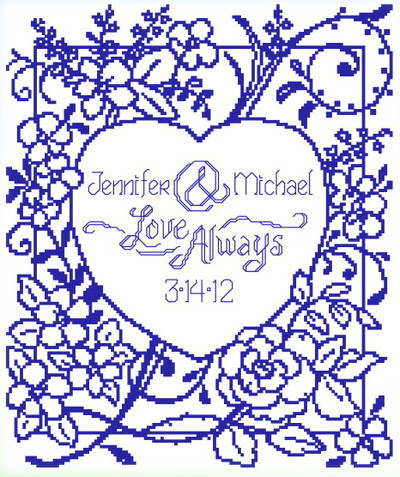 Having already completed and presented a wedding sampler this year I was not expecting to add another to my projects. But I was delighted when the invitation arrived. This will be the 2nd marriage for both which means of course that when they move into their new home together they will already have what they need and 2 of a lot of things. As a result they have asked for donations to be made to their favourite charities. 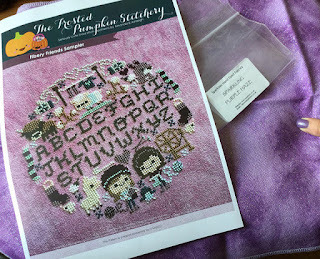 I will be happy to do this but wanted to stitch a sampler for them as well which I think will be appreciated. I think that the simplicity of the design will appeal to the happy couple. I am stitching it in a hand dyed silk by Jodyri Designs on a piece of hand dyed fabric from Sparklies. 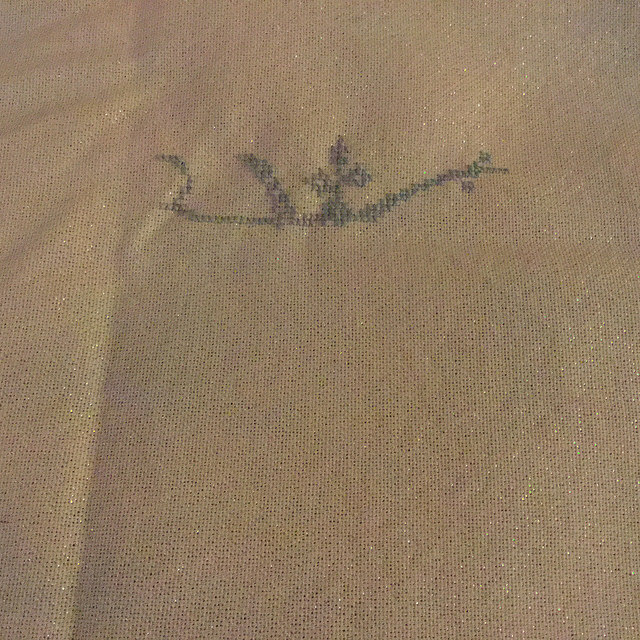 These are my first stitches to ensure that I am happy with the fabric and thread combination. The photo doesn't show the colours properly but I am happy with the look and as always love the feel of the silk thread. This will be my main gift project for the next few weeks as I have a deadline to meet. I am late posting my progress on the WIPocalypse SAL this month but at least it isn't because I haven't made any progress at all. This SAL is hosted by Measi who is now back to normal after problems with her website last month. I got my topics mixed up and reported on the June topic in May so this will be a fairly short post. 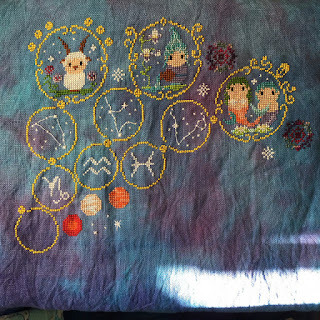 First of all I am delighted to report that I have completed another month on my CloudsFactory Zodiac Sampler SAL. 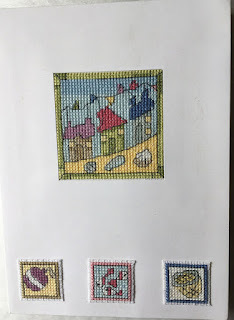 OK it is the March installment and June's has now been released but anyone who has read previous WIP posts will know that I have been really struggling with this piece due to the satin floss used for the frames. A few people suggested I unpick and re-stitch in DMC but I couldn't face that and felt that there was even more chance of this becoming a UFO if it did that. 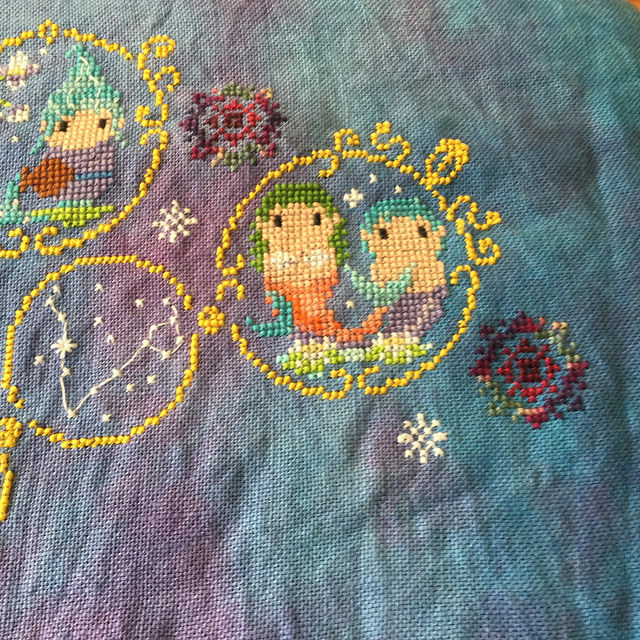 Instead I persevered and completed Pisces. 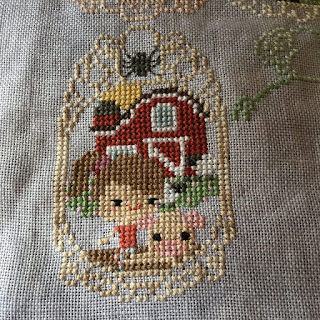 I am never going to be a fan of satin floss and fully expect this to be the last project I ever use it in but I do love the overall piece and the little figures are really cute. Excuse the strange white shadow on the bottom right of the photo - it was sunlight streaming through the window. On the other hand I really like the Weeks Dye Works threads that are used in the design so that sort of compensates for the satin floss. 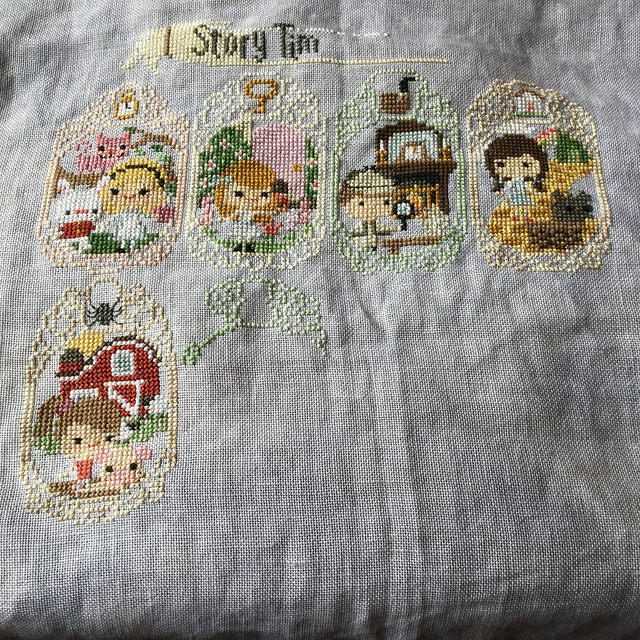 My second monthly SAL is the Story Time Sampler by The Frosted Pumpkin Stitchery and I have kept up to date with this one. 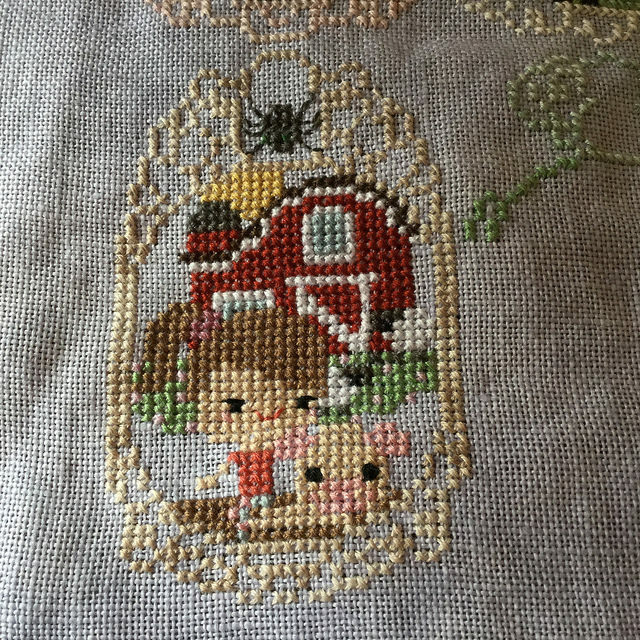 One of the cute features of this design is the image at the top of each frame - a spider this month. I've kept up with the Smalls SAL and will post about those separately. 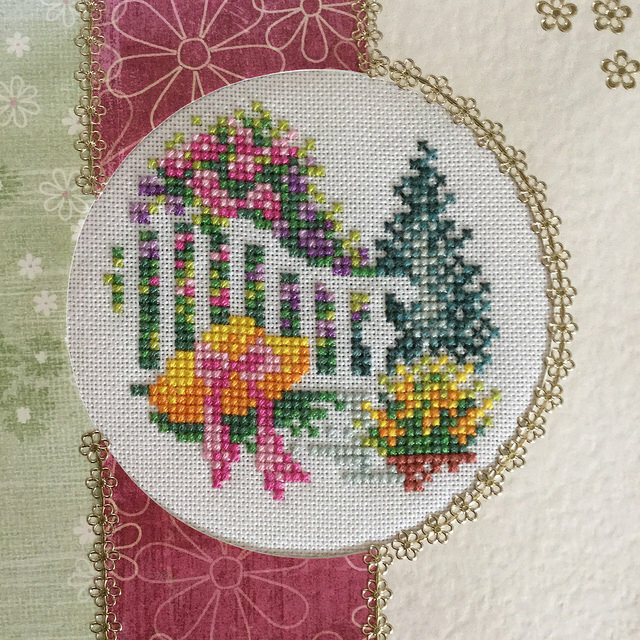 I have also added another wedding sampler to my WIPs but I will post about that in the Gifted Gorgeousness update. 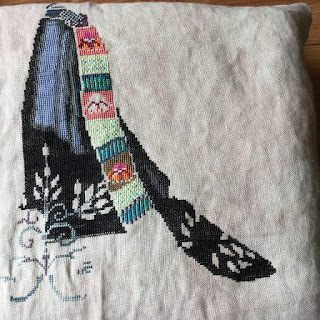 Although I originally thought of this as a Small (and it is only a small design) I have added Blackbird by Blackbird Designs to my WIPs list and I made a bit of progress on it in May. I also voted for the Blackbird in the English National Bird vote (result not yet declared). My other WIPs were neglected this month. Like many stitchers I also enjoy gardening so although the longer evenings are perfect for stitching there are other calls on my time. Are there any stitchers who are content to do nothing I wonder. Most of my stitching friends love to be busy. I'm late posting this update on the Smalls SAL for 2 reasons - I didn't actually finish a small design until late in the month and then I delayed posting about it because it was a gift for a colleague who occasionally visits my blog. But that's still no reason for not posting at the weekend. As usual Monday came around far too quickly without me opening my lap top. I use my iPad all the time but prefer to update my blog on a laptop or desk top with a proper keyboard. Anyway without further ado here is my May small - a retirement card for a colleague who is planning to spend more time in the garden. 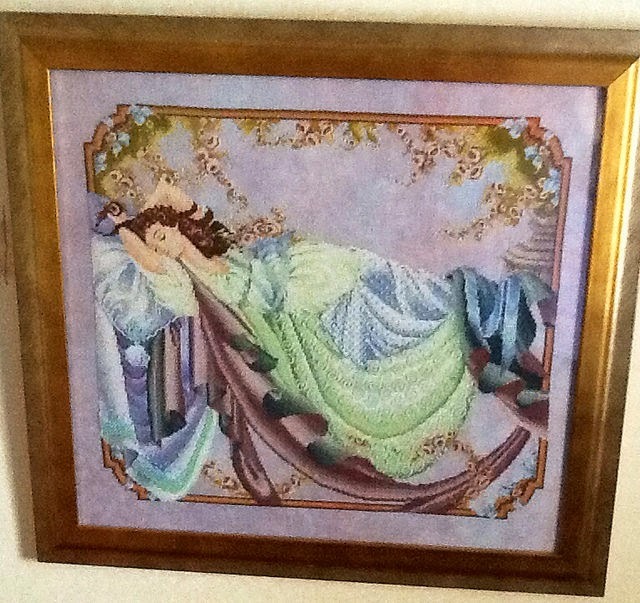 The pretty design was from an old cross stitch magazine using DMC and white evenweave. 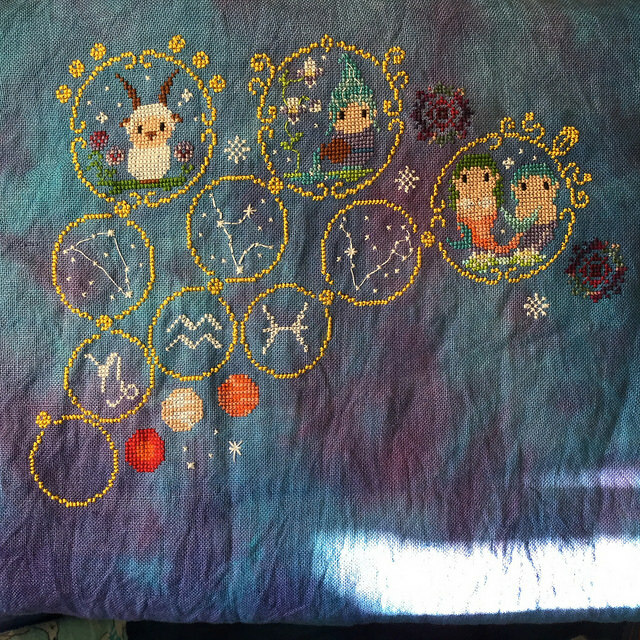 I changed some of the colours as I used some of those little bits of thread that I have accumulated from kits and finished projects. 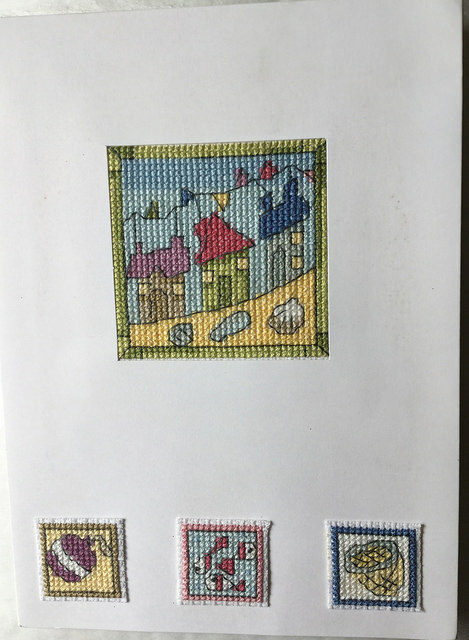 Having been behind in May I am already ahead for June as I have already finished the stitching on a couple of small designs. Hopefully I can finish at least one of these before the next report is due. Watch this space! This month I would like to talk about a French website called Jardin Prive which features the work of 2 designers Nathalie Cichon and Camille Camps. 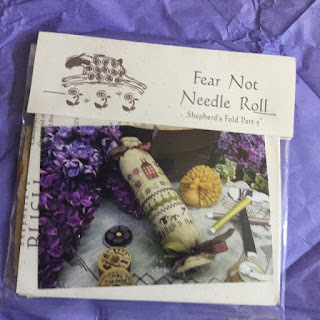 And as an added bonus for a fan of hand dyed threads they often use (and sell via their website) the beautiful Threads by Nina. The site is in both French and English and some of their designs have also been translated as they often use words in their work - this is one of the features I love as I have a passion for stitching designs with text. The WiP I have been working on from Jardin Prive is The Way to Happiness and I'm delighted to say that I have finished it. I started it in July 2014 and finished it in May 2015. I enjoyed every single stitch and the only reason it took so long was that other priorities came along. 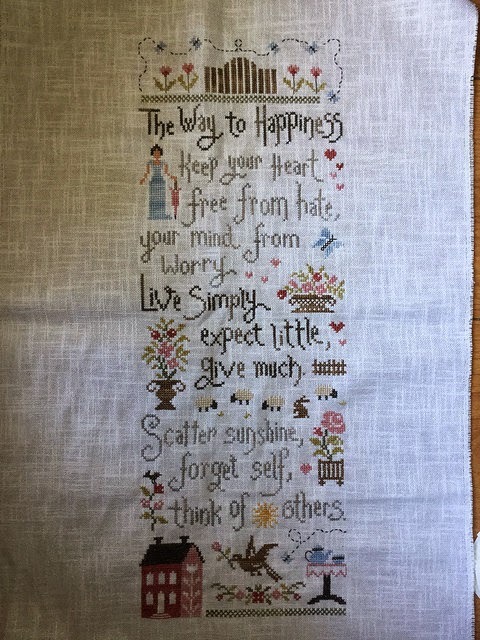 I chose to stitch it on white 28 count linen using Threads by Nina which are subtle hand dyed threads available from the Jardin Prive site. Here is a link to the Jardin Prive site where you will see that the design has been produced in 5 languages - French, English, German, Spanish and Italian and even better is completely free. 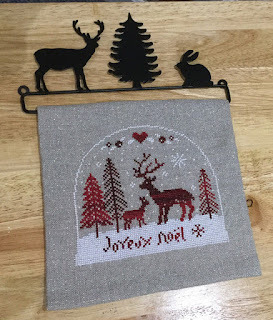 I would love to stitch the piece again in the French version and have enough fabric and threads to do this. 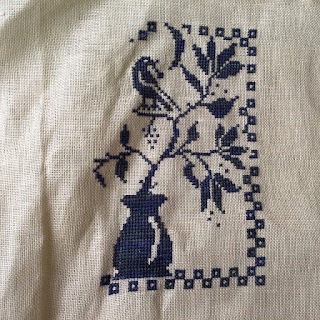 This is the first piece I've stitched from Jardin Prive but I'm hoping it won't be the last. Not only are there lots of other freebie designs on the site which I really like I also bought a few of the paid for patterns last year including a Christmas pattern which came with wooden buttons. I particularly like the free Fleurs de Cotons design as well as the cute sheep (moutons). There is an alphabet series which appeals to me - lots of words again. Here is the link to H for Harmonie. As well as the subject matter and the colours used in the designs I really like the fact that you can choose between pdf or printed chart. I am increasingly using pdf charts on my iPad to stitch from as I love the way I can zoom in on the area I am working on and then zoom out to get the full perspective on the design. As a confirmed linen lover I like the way that designs are shown on linen. 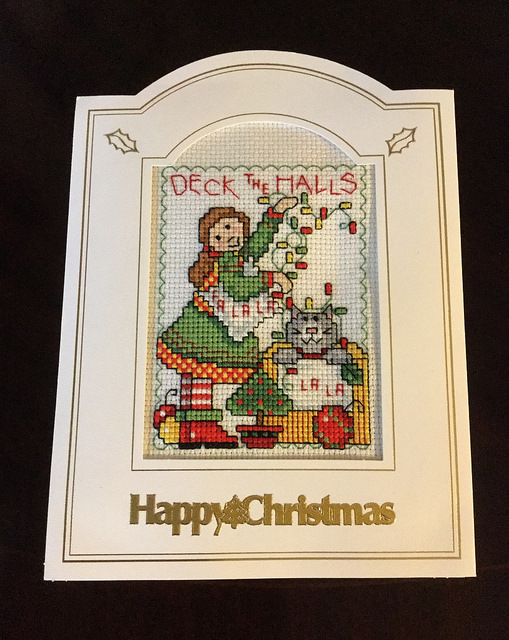 There is very little backstitch or confetti stitching or fractionals making them nice and easy to stitch. What do I have to do for each month's post? What project are you talking about this month? - Please include the full name of the design, designer and artist (if applicable), and a link to what the design will look like when finished, if possible from the designer's own homepage. Have you stitched a project by this designer before? 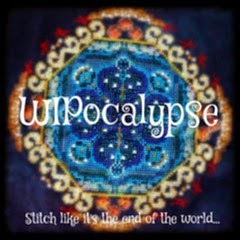 Would you buy/stitch a design by this designer again? Why/Why not? What made you choose this particular design/designer? Feel free to add any other information you want to share in your post.